Andre Faaij is Associate Professor at the Copernicus Institute for Sustainable Development, Utrecht University, Utrecht, the Netherlands, where he coordinates research on sustainable energy supply and system studies. Continuing growth in woodfuel consumption is forecast for developed countries, especially in the European Union, as a result of new energy and environmental policies enacted to reduce greenhouse gas emissions. 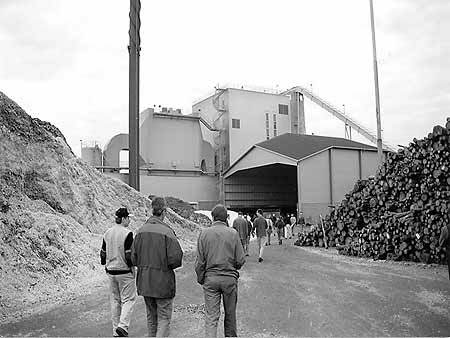 Several industrialized countries such as Sweden, the Netherlands and Finland, and some developing countries, particularly in the Near East, already make use of most of their available woody residues (from both forests and forest industries) and are starting to seek opportunities for cheap woodfuel supply from other countries. Thus today there is an emerging international trade in woodfuels, especially in and to northern Europe (Hillring, 2002; Vesterinen and Alakangas, 2002). Certain regions, particularly Latin America, parts of North America, parts of sub-Saharan Africa, Eastern Europe and Australia, have the potential to produce enough biomass that even after covering growing domestic energy demands, a net surplus of biofuel can be sustainably produced. In those situations where the price can be competitive with other uses of the wood, such countries and regions may become net suppliers of renewable bioenergy to countries that are net importers of energy. Types of biofuels in international trade can include simple solid biomass such as chips, logs, bales and charcoal as well as bioenergy carriers such as bio-oil, ethanol, methanol, hydrogen or even electricity (Suurs, 2002). The performance of the trade chain is influenced by many variables such as transport distance, fuel prices and equipment performance. The biomass production method, the type of transport and the choice and order of pretreatment operations are also important. Various studies (Suurs, 2002; Agterberg et al., 1998) have given indications that intercontinental trade of biofuels or even bulk transport of wood could be economically feasible and does not lead to dramatic energy losses. International trade of solid biomass for energy, especially fuelwood and charcoal, already takes place on a relatively modest scale. The following are some examples. The export of forest residues from the Baltic countries to the Netherlands entails inland transport, transfer and shipping over 1 500 km in small vessels. The chain’s overall energy use is 5 percent of the energy content of the biomass transported. Sweden makes structural use of imported biomass fuels, mostly from the Baltic region and southern Europe, mainly to stabilize prices on the national market. The total volume amounts some 20 to 30 petajoules (PJ) per year (Vesterinen and Alakangas, 2002). Saudi Arabia imports charcoal – valuing some US$8 million in 2000 (FAO, 2002) – to meet the country’s sizeable demand for use in barbecue, roasting of coffee beans and incense burning. increases in utilization of biofuels. The demands for food, bioenergy and biomaterials are closely linked. The economic drivers, however, have not yet been well studied. It is uncertain to what extent the transitions required to exploit the global bioenergy potential are feasible. To secure the public support needed for large-scale implementation of biotrade schemes, research is needed on a number of environmental, social and economic questions. What are the environmental and socio-economic impacts of biomass production and export systems, and how does biomass or bioenergy export from the local level compare to local bioenergy use, alternative land uses and carbon sequestration options? What are the sustainable levels of production under different conditions and developments? How can agricultural and agroforestry systems be designed for sustainable biomass production? How will such production systems benefit or disadvantage local actors? How should biomass production and the related logistics be organized to minimize harmful impacts and maximize benefits? What organizational structures and changes are needed to introduce export-oriented biomass production systems? What are the implications of existing international law on biotrade schemes? What is the institutional framework for biomass trade? Who are the major actors involved, and what are the political, legal, social, economic and ecological impacts on them? How should complete bioenergy systems be implemented over time? What are the most promising approaches and strategies? At worst, a large demand for bioenergy, for example triggered by carbon taxes and the Clean Development Mechanism in industrialized countries, could compete with food production for the better soils and water supplies, resulting in the displacement of poor farmers from their land. This could jeopardize the food security of the poorer parts of the population and could potentially trigger large-scale deforestation and unsustainable agriculture. At best, however, bioenergy could become a strong driver behind local economic development and, when linked to modernization of agriculture, could lead to improved and sustainable land use. Integrating bioenergy production with local development could also lead to a wide variety of production systems, such as agroforestry methods that deliver a multitude of products, one being energy. Such additional benefits could serve as an incentive for international export-oriented bioenergy projects. Agterberg, A., Faaij, A., Hektor, B. & Forsber, G. 1998. Bioenergy trade: possibilities and contraints on short and longer term. Karlstad, Sweden, Bio-energy Vast/Utrecht, the Netherlands, Utrecht University/Uppsala, Sweden, Swedish University for Agricultural Sciences. FAO. 2002. FAO Yearbook of Forest Products 2000. FAO Statistics Series No. 158. Rome. Hillring, B. 2002. European wood energy markets. Presented at the 60th session of the UNECE Timber Committee, Geneva, Switzerland, 24-27 September. Hoogwijk, M., Faaij, A. van den Broek, R., Berndes, G., Gielen, D. & Turkenburg, W. 2002. Exploration of the ranges of the global potential of biomass for energy. Biomass and Bioenergy, in press. Suurs, R. 2002. Long distance bioenergy logistics. Utrecht, the Netherlands, Copernicus Institute, Utrecht University.